Okok, now I still have a lot of Szechuan Peppercorn left and whenever I come into contact with recipes that utilizes them, I get all excited. Somehow we didn't get the numbing effect after consuming this, or maybe we didn't bite into the peppercorns. We spit it out whenever one gets into our mouth. But it sure does taste good. 3. In a hot wok, put in ½ cup of cooking oil. Let oil heat up, make sure your spatula is heated and coated with oil too. 4. Put in chicken and spread it around. Do not toss it. 5. Let it cook for a while then only flip the chicken. Cook until there are no more juices and chicken seems to be releasing oil. Drain and dish up. 6. Discard some of the oil if it’s too much. On high heat, sauté smashed garlic and ginger. When it’s fragrant, put in Szechuan peppercorn, dried chilli and half the fresh chilli. Cook until it is very fragrant. 7. Put cooked chicken back into wok and toss. Cook for 1 to 2 minutes and put in gravy mixture. 8. Cook until gravy is reduced to preferred consistency. Taste and give it a quick adjustment. 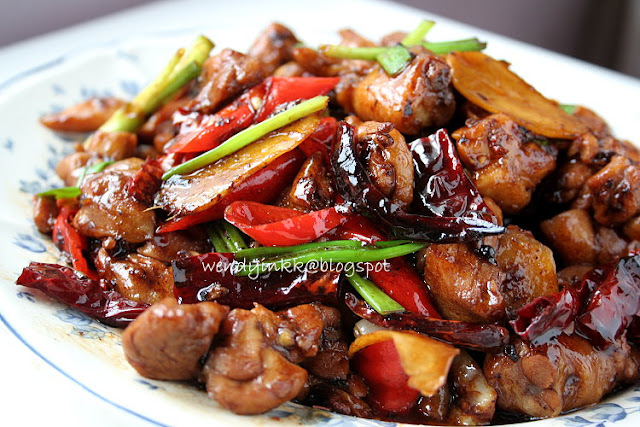 It looks like "kung po" chicken that i have in Esquire Kitchen in KL. Between what is szechuan peppercorn? is it black pepper? but i thought the picture looks perfect! the vibrant reds from the chilli and green from the spring onions make the chicken look so tempting! 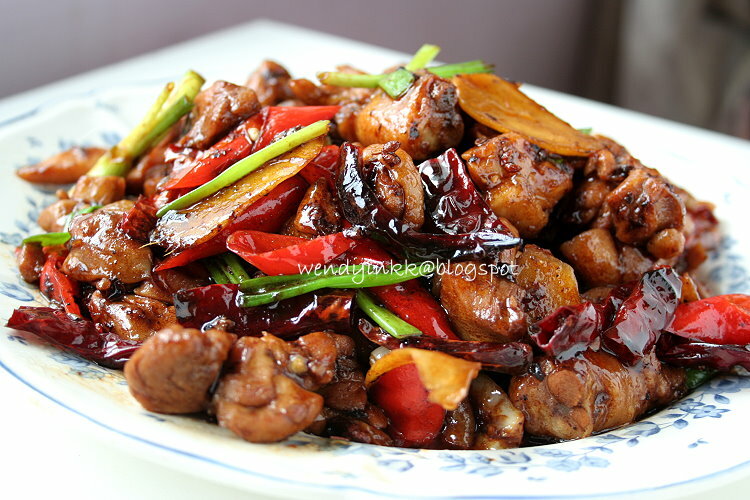 Szechuan peppercorn can be bought at Chinese Herbal Shops and it's called "Far Jiu", and the picture can be seen on my fragrant pork belly post. Haha, it's still out of focus. Even I get frustrated with my P&S...but ur pic looks really cool and vibrant....and yum!!! Your pictures are very fabulous makes the viewer all the more crazy with cravings. Mind is atrocious because I used to and sometimes still do, take pictures with my old nokia hp as I write very impromptu sometimes and need to take the picture quick and immediate - very compulsive person I am. Haha, patience... be patient. The pictures are not going to smell stale, if they do, gosh, my blog will be super stinky. Haha, Wendy, sometimes I'm frustrated with the photos I took also and then more editing jobs are needed. So I always pray for good weather, if the environment is dark, my photos will turn out badly. I know what you mean! The tiny little LCD screen is very deceiving! I love the aroma of the dried chillies.....the gravy that the dried chillies soaked up is real nice! You are so right about pix. From the camera screen they look fine until you load it up in the laptop and everything look blurr..ha ha.. Like you sometime I can't even find a pix that I like. Thanks for trying out this dish. If you like more numbness, crush the peppercorn a bit before adding it into the dish. You are so right, patience is a virtue. But sometimes reality is never as pretty as what you see in pictures so one can get really disappointed to find that the real thing is always not as gorgeous as what is portrayed. Hv u ever been disappointed with the food or place that you read in papers and magazines that looked so attractive and ended up so ordinary in real life or a dress or bag you buy on line? Haha, get a flash. That's what I use for night shots. Yeah, you'll need lots of it. Ok, next time I'll grind them fine. Thanks for sharing this dish. Haha, talk abt magazines. I'll look at who are the recipe contributors and I'll cross out any recipes I come across in the future that are submitted by them. Newspapers are supposed to write nicely about the restaurants they review, Malaysian media tends to be too courteous and $$$ minded to tell the truth about everything. If they ever employ me as a food writer, I'll be sure to lose my job within a week. HAHAHAHAH! I have to say that I really love your photos, ^^, it's bright and so colorful. nothing is wrong with the picture, your chicken looks perfect..looks like those ' kung po frog'. i'm a lousy photo taker too but i guess your expecttaion is much higher than me, haha! oh, i will get bcak to you asap reg that meeting..most likely not. Not sure what you're on about... the photos looks so delicious...i could eat the screen. Not sure if I'll be able to find szechuan peppercorns..but will def. try! This was really awesome. I doubled the recipe, but I only put 2 tbs soy sauce and 2 tsp sugar for the sauce, didn't put the chilis cause I'm a scaredy cat, and only put 1 tbs szechuan peppercorns (same reason). It was delish, worthy of the company we had over, and the BF finished what was left after his first portion. Success all around, and the szechuan peppercorns leave a pleasant "perfume" in your mouth. This one's a keeper. I would like to try out some of your receipes. I know that you are staying in KL..No idea whether the ingredients stated in your recipes can be found in Singapore or not? especially the Szechuan peppercorn. The Szechuan pepper corn chicken with casher nuts is the first dish that i would like to try out. Oh no, I do not stay in KL. I am sure you can find everything in Singapore. I had a similar sounding dish when I was in Taiwan last week. The szechuan pepper corn was a great taste and I loved the tingly/numbing sensation.